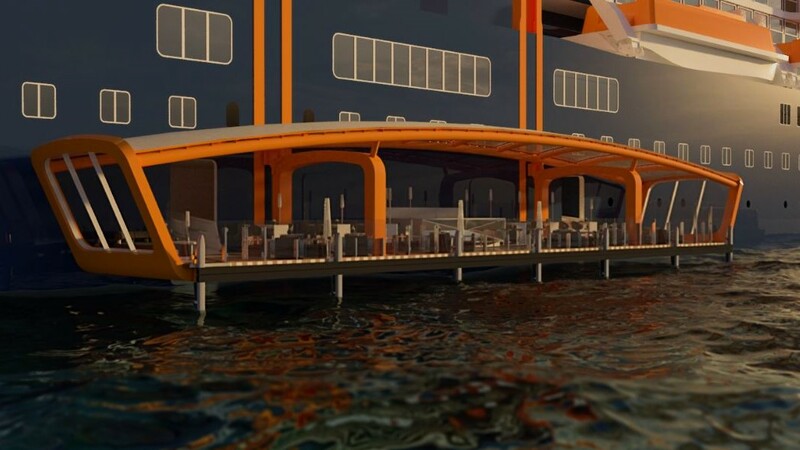 Celebrity Cruises has revealed a first look at the future of modern luxury travel. 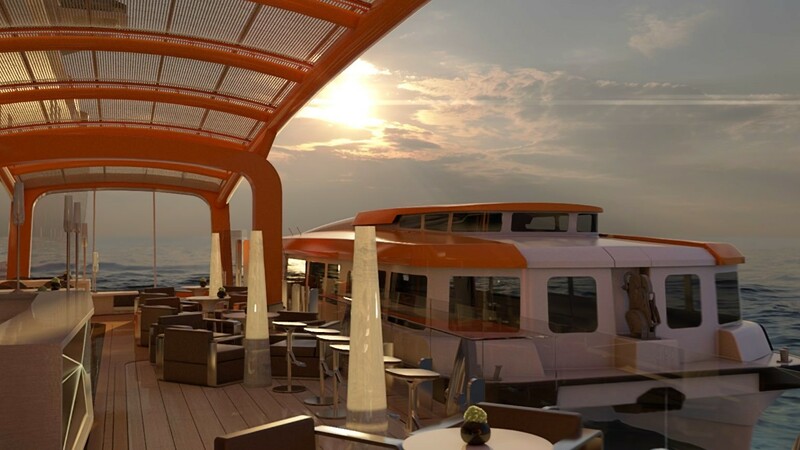 With dramatically expanded staterooms, a ship-climbing Magic Carpet platform and stunning suites Celebrity Edge sets a new standard for future ship design. 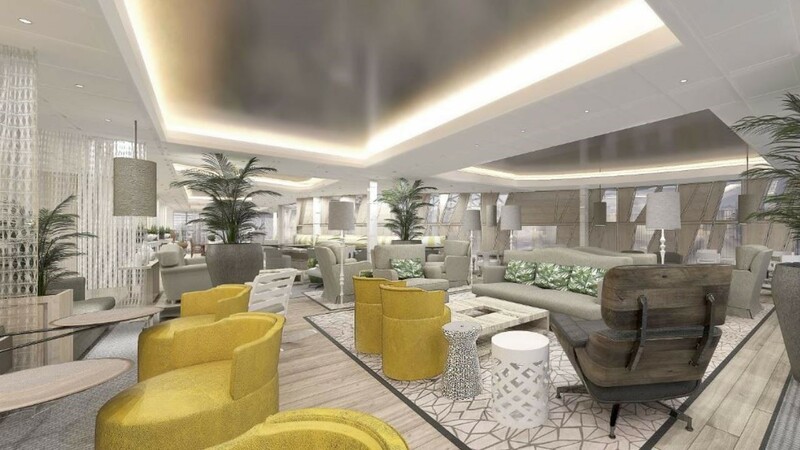 To help create its first new ship class in 10 years, Celebrity brought in a design and architectural dream team from around the globe to push the boundaries of ship design and to evolve luxury travel at sea, including interior designer Kelly Hoppen and visionary architect Tom Wright. 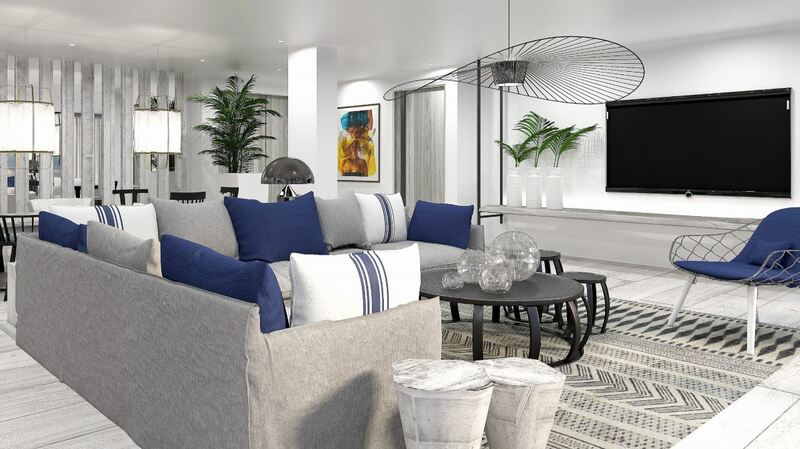 Under the guidance of American designer Nate Berkus, Celebrity Edge’s design ambassador, the team has created designs that are fresh, exciting, current and comfortable – the essence of Celebrity’s Modern Luxury style. 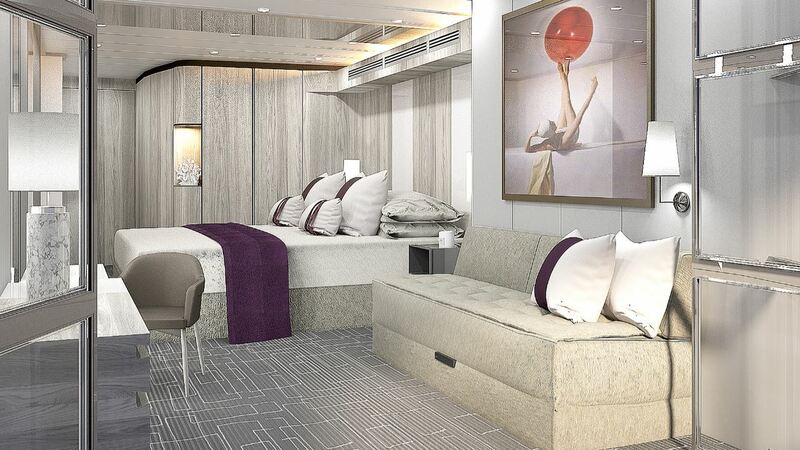 The revolutionary designed staterooms onboard Celebrity Edge erase the boundaries between the traditional ship stateroom and its veranda, creating a closer connection to the ocean. 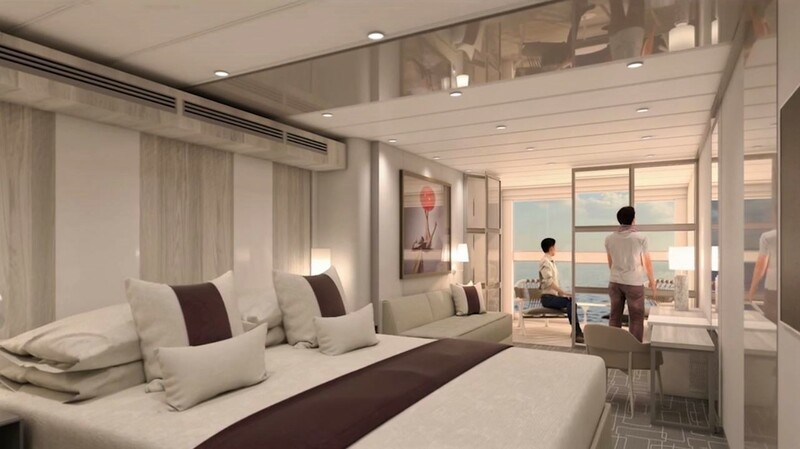 The new Edge Stateroom with Infinite Veranda turns guest quarters into a seamless space, from the room’s door all the way to the water’s edge. The simple touch of a button gives guests open-air access to the sea, bringing the outside in and the inside out. With the touch of another button, guests can take complete control of their stateroom and personalize everything from lighting, shades, temperature and service. The design of the 918 Infinite Veranda staterooms adds 23 percent more square footage and 10 percent larger bathrooms than onboard Celebrity’s Solstice Class. 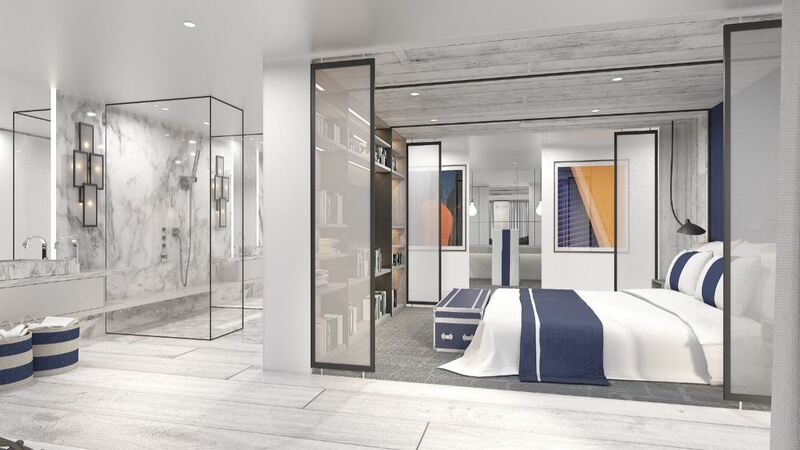 99% of the staterooms on Celebrity Edge will have a king-sized bed, featuring exclusive cashmere bedding and Italian handcrafted mattresses. 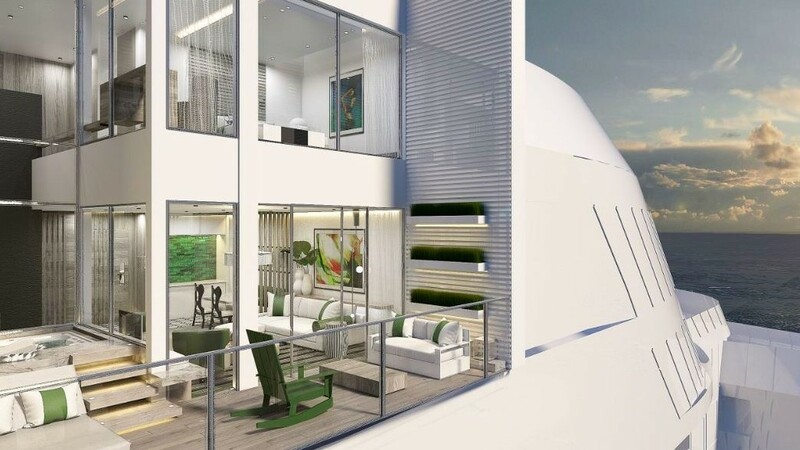 In addition to 174 different options to connect staterooms, Celebrity Edge will also introduce 16 single staterooms with Infinite Veranda, created for the modern travelers who love to explore the world on their own. With Celebrity Edge, Celebrity has more than doubled the number of available suites, adding two spectacular new categories. At the top of the line are two new Iconic Suites. The suites are positioned high on top of the ship, above the bridge, offering sweeping, panoramic views from front to back making Iconic Suite guests feel like they are on top of the world. The Iconic Suites are the largest suites in the fleet: each suite is an opulent 1,892 square feet and offers a 270-degree view of the ocean. This doesn’t include the expansive outdoor space – with private hot tub, stylish furnishings, and a covered, double daybed – which adds more than 689 square feet to the grand total. Iconic Suites boast two bedrooms (each with a king-sized Cashmere Collection bed) and two full bathrooms, featuring a full shower and whirlpool tub. With enough space for six guests to comfortably unwind in, there’s even an in-suite butler’s pantry for those occasions when guests feel like entertaining. Another new Suite Class comprises six split-level Edge Villas. The unique design of the 950 square feet Edge Villas seamlessly blends indoor and outdoor living. With two stories of windows that look out over the terrace (featuring a three-feet-deep plunge pool and inviting lounge furniture) to the incredible ocean views beyond, it’s an open and airy environment that truly invites the outside in, and vice versa. With one bedroom and two bathrooms the villas are perfect for up to four guests. Edge Villas not only offer private outdoor terraces, but they also have direct access to The Retreat, an exclusive area for Suite Class guests. Guests can step right out to The Retreat Sundeck and The Retreat Pool and Bar, or retreat to their own private oceanfront villa. 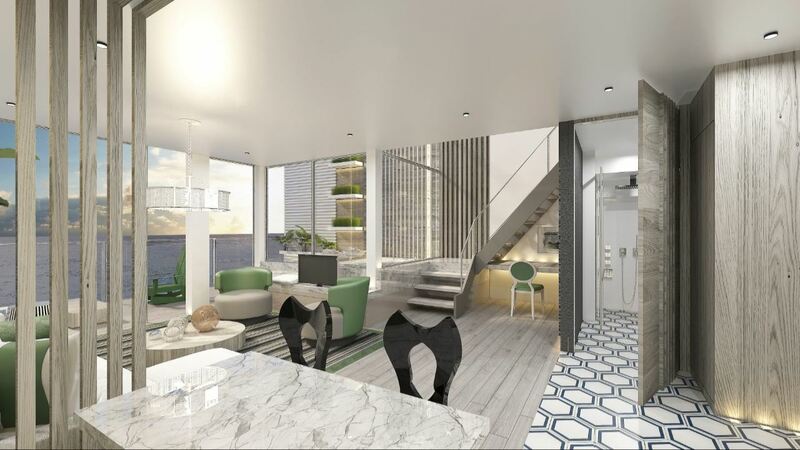 The two-bedroom, two-bathroom Penthouse Suites combine all the innovative amenities of the luxury staterooms with the exclusive benefits of being a Suite Class guest. They include a master bedroom, bathroom with large dual walk-through showers, a dressing room, living/dining area, guest bedroom and bathroom, terrace and private hot tub, plus a butler on hand to ensure guests never have to lift a finger during their vacation. Penthouse Suites also offer the latest technology, allowing guests to precisely adjust nearly every comfort feature. With a simple touch screen, the in-room automation allows them to control everything from lighting to temperature. 146 large, outward-facing Sky Suites are designed with beds that face the balcony. Behind the bed, a panel to the bathroom opens up (it’s a mirror on the bathroom side) giving the bathroom a view of the sea. 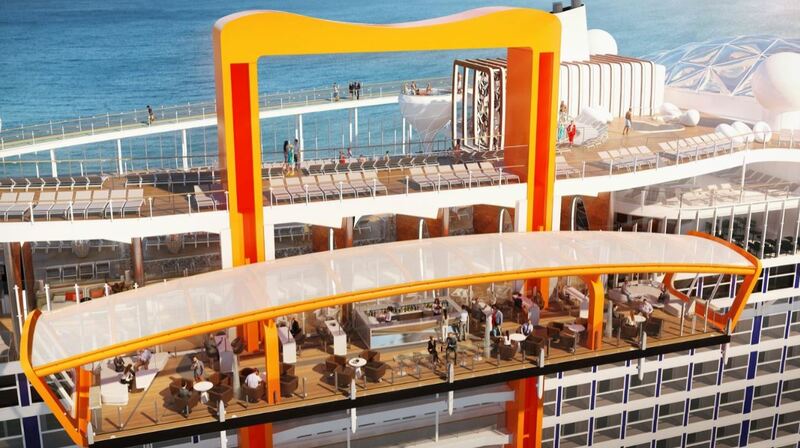 The ultimate sanctuary for travelers on board Celebrity Edge will be the new private utopia called The Retreat. 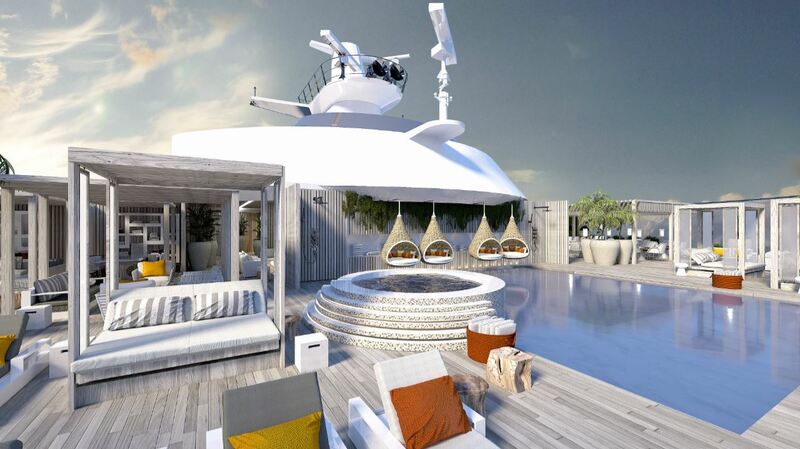 The Retreat Sundeck will feature a private full-sized pool a hot tub and Pool Butlers. Beyond its outdoor spaces, there’s The Retreat Lounge – a space available 24/7 for beverages, gourmet bites, and live entertainment. Here, guests will have access to an exclusive concierge who’ll make any arrangements they need and around-the-clock personal butler service. The exclusive Suite Class restaurant Luminae @ The Retreat will be open for breakfast, lunch, and dinner and serve a cuisine crafted by a Michelin-starred chef. 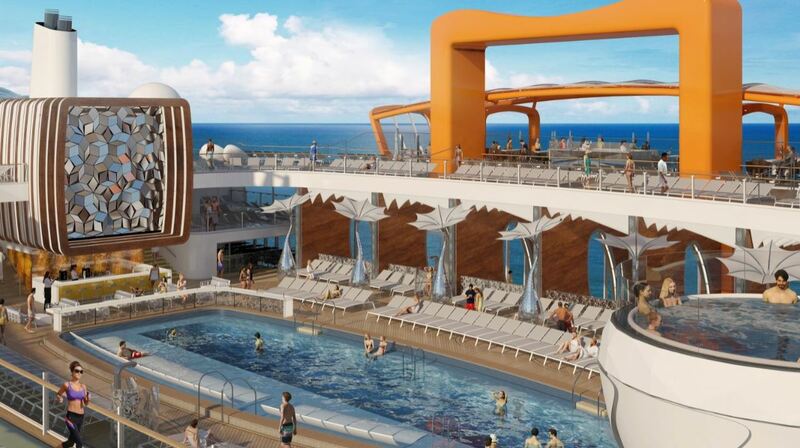 The Celebrity Edge Pool Deck has been designed as an outward-facing asymmetrical space that makes ocean views and landscapes the focal point. 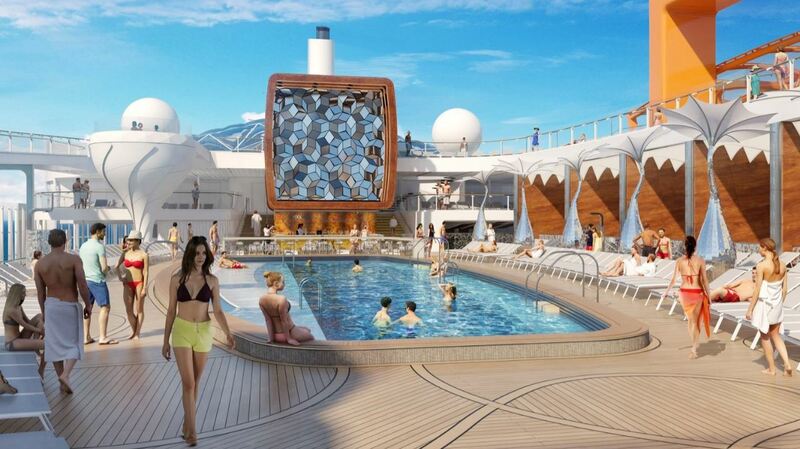 At the center of this space is a 25-yard lap pool, the largest in the fleet, featuring in-pool loungers. Positioned magnificently above the Pool Bar is an oversized and ever-changing mirror installation. Along with unique tree sculptures that add an air of whimsy, it’s part of a remarkable poolside gallery that sets this space apart from any other at sea. Another attention-grabbing addition to the pool deck are two striking, two-story martini hot tubs, that take unwinding at sea to new heights. Just off the pool deck are outward-facing, private cabanas. Spacious (165 square feet) and airy (more than 18 feet high), these luxurious coves invite guests to climb in and get lost in the plush seating and incredible views of the sea. At night, ambient lighting turns the cabanas into intimate spaces perfect for enjoying cocktails and the moonlight glimmering off the ocean. Also located on the Resort Deck is one of the most popular spots on every Celebrity ship, the adults-only Solarium. 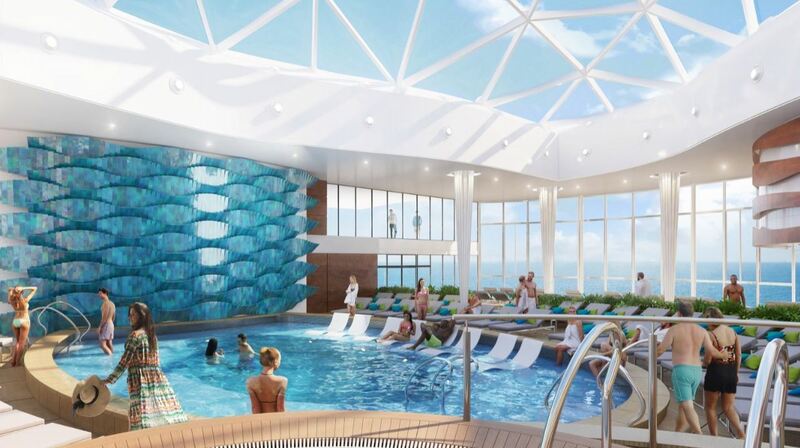 Celebrity Edge continues the tradition of offering a covered pool area where adults can unwind in a serene atmosphere inspired by the colours and movement of the ocean. 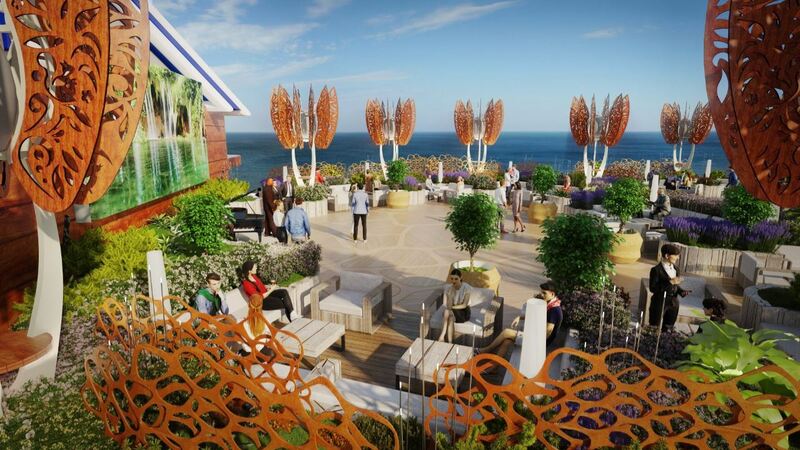 The Destination Gateway will be a modern, multi-purpose area on Celebrity Edge that transforms from a luxury embarkation station into an intimate setting for destination enrichment talks and additional programming. When the Magic Carpet is positioned here, The Destination Gateway serves as a comfortable and welcoming environment that leads to the Edge Launches for transportation ashore. It immerses guests in the destination they are about to visit with highlights of that port of call displayed on large LCD screens. 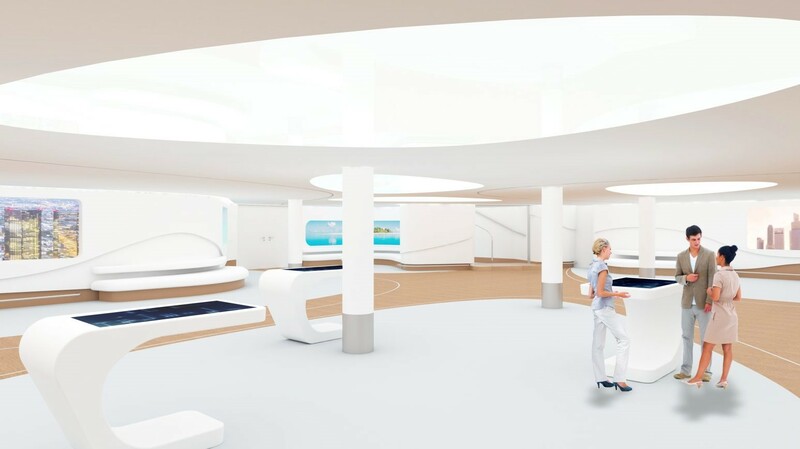 When not in use for tendering ashore, The Destination Gateway is a learning and activity center where Celebrity will host destination enrichment talks, Celebrity Shore Excursion information sessions, and more. The area also becomes a stylish extension of the Teen Center when added space is needed for gaming tournaments and other activities. Plus, business groups and corporate incentive groups can utilize this space as a modern, state-of-the-art conference room for meetings and presentations. Edge Launches have been newly reimagined for an improved tender experience. Featuring bucket seats, air conditioning, large windows for stunning sea-level views, and more space, Edge Launches are designed to get guests to their destination in modern luxury style. The 2,918-guest Celebrity Edge will homeport in Fort Lauderdale, FL., making her first sailing on December 16, 2018. Edge will sail two 7-night Caribbean itineraries. An eastern Caribbean cruise visiting San Juan, Puerto Rico; Tortola, British Virgin Islands; and Philipsburg, St. Maarten. The western Caribbean will call on Key West, Florida; Costa Maya, Mexico; Cozumel, Mexico; and George Town, Grand Cayman. 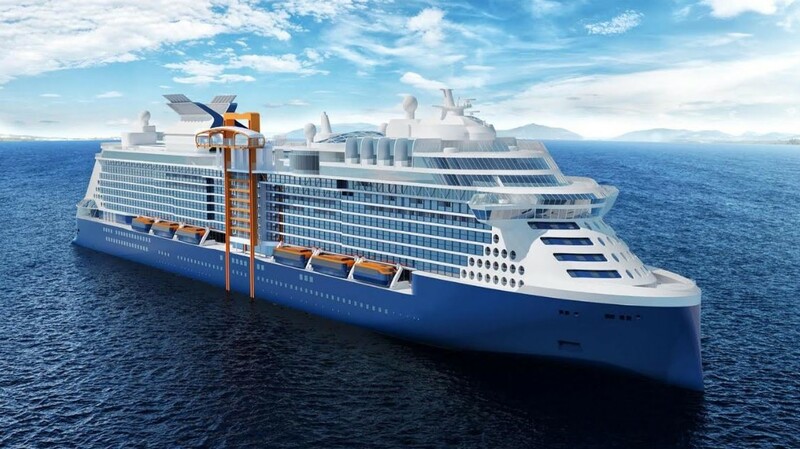 Celebrity Edge will be joined by three sister ships. Starting with Celebrity Beyond in 2020, the next ships are sheduled for delivery in 2021 and 2022. Pictures courtesy of Celebrity Cruises. I can hardly wait for my FIRST sailing on Edge; booked Eastern Caribbean April 2019 sailing. I anticipate that it will be an ABSOLUTELY FANTASTIC experience!! Hallelujah… Ain’t Life Grand?!!! !